The ability of IFN-γ to antagonize established Th2 type allergic responses is well documented. To investigate the role of IFN-γ-inducible protein 10 kDa (IP10) in the allergic response, we chose to investigate the effect of IP10 neutralization on an established Th2 response. Systemic neutralization of IP10 at the time of allergen challenge increased airway hyperreactivity as well as airway eosinophil accumulation. Interestingly, IFN-γ levels were markedly reduced in both the lung and peripheral lymph node following IP10 neutralization. 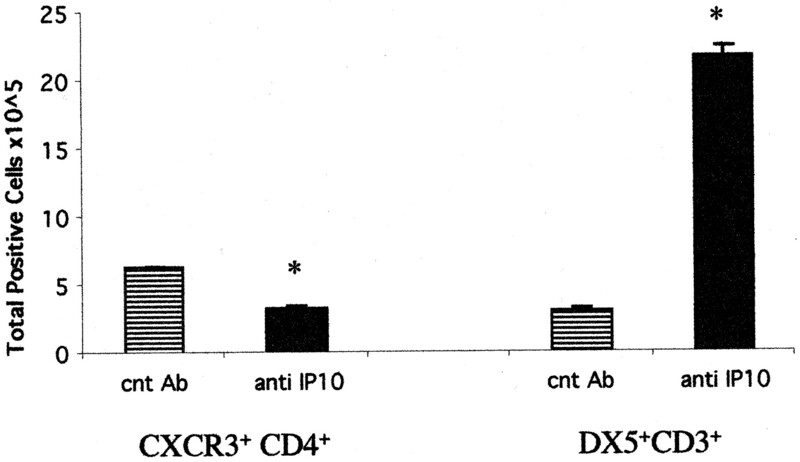 Furthermore, the number of CXCR3+CD4+ T cells was decreased in the peripheral lymph node following neutralization of IP10. Introduction of exogenous IP10 into the airway at the time of allergen challenge also dramatically increased eosinophil accumulation in the airway. 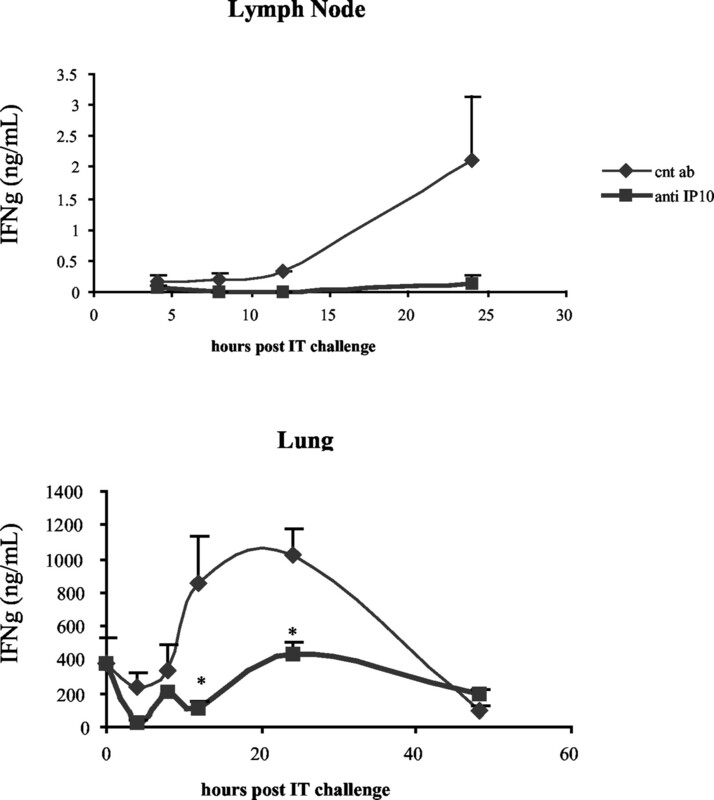 Protein levels of IL-4, IL-5, and IL-13 were significantly increased in the lung following exogenous airway administration of IP10 with allergen. Interestingly, airway hyperreactivity was significantly decreased at early time points following concurrent IP10 and allergen challenge but rebounded at 24 and 48 h post allergen challenge. Although IP10 may initially be acting locally to dampen the allergic response, its ability to recruit eosinophils may ultimately supersede any immunomodulatory effect it may have in an established allergic response. These results suggest that while systemic levels of IP10 are beneficial in controlling the allergic response, possibly by regulating cellular trafficking in the lymph node, local administration of exogenous IP10 into an established allergic response may be detrimental. Allergic asthma is an increasing health concern especially for children living in metropolitan areas (1, 2). Allergic asthma is characterized by a robust phenotypically “Th2” type inflammatory response arising from an intense lymphocytic infiltration of the bronchial mucosa and elaboration of Th2 type cytokines such as IL-4, IL-5, and IL-13 (3, 4, 5, 6, 7). The selective chemokine-mediated recruitment of subsets of T cells and eosinophils into the lung allows for the elaboration of epithelial cell damage and increased airway hyperreactivity, characteristic of the asthmatic response (8, 9, 10, 11, 12). Chemokines are chemotactic cytokines that function in the recruitment of specific cellular populations to sites of injury and inflammation. Chemokines are divided into two main families, CC and CXC, according to the positioning of two conserved cysteine residues in the N terminus. The CXC family of chemokines can be further divided into families based on the presence of a glutamate-leucine+ arginine amino acid motif (10). IFN-γ-inducible protein 10 kDa (IP10),3 monokine induced by IFN-γ (MIG), and IFN-inducible T cell α chemoattractant are members of the CXC/ELR− family of chemokines. These proteins are induced by IFN-γ in a variety of cells including monocytes and epithelial cells (13). IP10, MIG, and IFN-inducible T cell α chemoattractant are ligands for the chemokine receptor CXCR3 (14). CXCR3 is predominantly expressed on CD4+ and CD8+ T cells that are CD45RO+ and express high levels of β1 integrins along with NK cells and monocytes (15, 16, 17). In addition, it is widely reported that T cells expressing the receptor CXCR3 are specifically recruited to sites of inflammation that exhibit a “Th1” type phenotype such as rheumatoid arthritis and inflammatory bowel disease (18, 19, 20, 21). It has been established that Th1 and Th2 responses are antagonistic to each other (22, 23, 24, 25, 26). Administration of IFN-γ into the airways of allergic mice has been demonstrated to reduce the severity of the Th2 type response and attenuate asthma-like responses (27, 28). However, it is unclear whether IFN-γ acts directly or indirectly by altering local and/or systemic inflammatory immune responses. Recently, it has been shown that overexpression of IP10 during sensitization to OVA decreased levels of IL-4 and eosinophil accumulation in the airway following OVA challenge (29). To further investigate the role of IP10 in the allergic response, the effect of neutralization of IP10 at the time of allergen challenge was investigated in these studies. 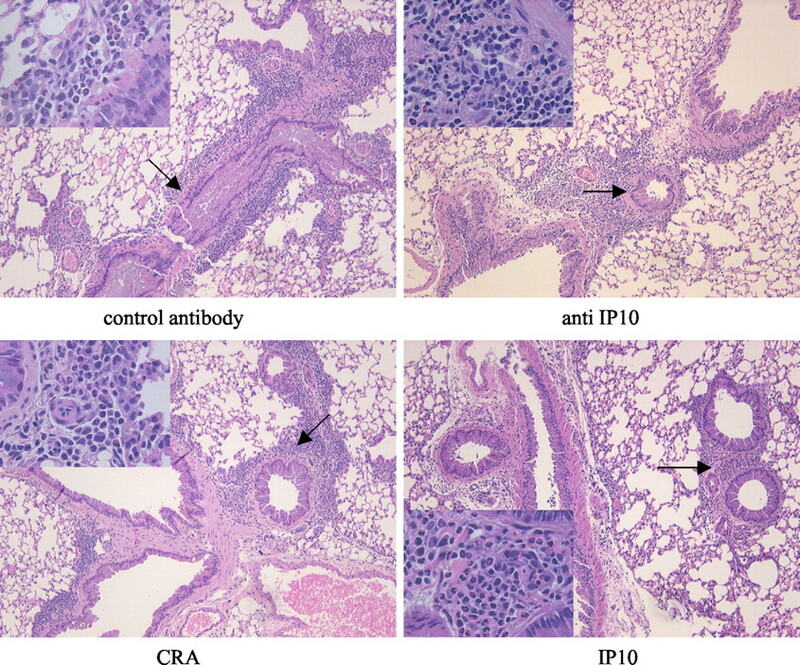 Unlike previous studies, the role of IP10 was examined during an established allergic response that is characterized by eosinophilia and airway hyperreactivity. BALB/c mice 6–8 wk of age were purchased from The Jackson Laboratory (Bar Harbor, ME) and were maintained under standard pathogen-free conditions. Our institutional animal use and care committee approved all experiments described. Normal BALB/c mice were sensitized i.p. and s.c. with 1,000 protein nitrogen units (PNUs) of cockroach Ag (CRA) (Holliser Stier, Toronto, Canada) in IFA (Sigma-Aldrich, St. Louis, MO). The mice were challenged intranasally (IN) with 150 PNU CRA on day 14 following initial sensitization to localize the response to the lung. Previous studies in our lab have demonstrated that IN CRA challenge on day 14 following sensitization induced little inflammation in the lung. To systemically neutralize IP10, mice were injected i.p. with 0.5 ml of either control rabbit serum or serum containing Ab against murine IP10 (generated in our lab as previously described) (30) on day 20 following initial sensitization. Briefly, New Zealand white rabbits were purchased from The Jackson Laboratory and housed under standard conditions. Rabbits were immunized using 20 μg of recombinant murine IP10 (PeproTech, Rocky Hill, NJ) in CFA, 1.5 ml was injected intradermally in multiple sites, and 0.5 ml was injected i.p. Two and 4 wk following the initial immunization, the rabbits were boosted with 10 μg of IP10 in IFA intradermally and i.p. The rabbits were injected with 10 μg of IP10 protein in IFA every 2–4 mo thereafter. Blood was collected from an ear artery and the serum was extracted. The rabbit serum was titered by a direct ELISA and only serum with an Ab titer >1 × 105 was used in in vivo experiments. The serum was also tested for cross-reactivity against murine C10, eotaxin, IL-1β, IL-4, IL-12, IL-13, IL-18, JE, KC, monocyte chemoattractant protein 3, monocyte chemoattractant protein 5, macrophage-derived chemokine, MIG, macrophage-inflammatory protein 1α, macrophage inflammatory protein 2, RANTES, stromal cell-derived factor, thymus and activation-regulated chemokine, TCA3, TNF-α, IFN-γ, six-cysteine chemokine, and fractalkine using a direct ELISA. Forty-five min following Ab administration, the mice were anesthetized with 150 μg/kg ketamine and 45 μg/kg xylazine in normal saline and the trachea aseptically exposed and prebored using a 21-gauge needle. CRA (320 PNU) in sterile PBS in a total volume of 40 μl was instilled into the trachea using a Hamilton syringe and wounds were closed using surgical staples. 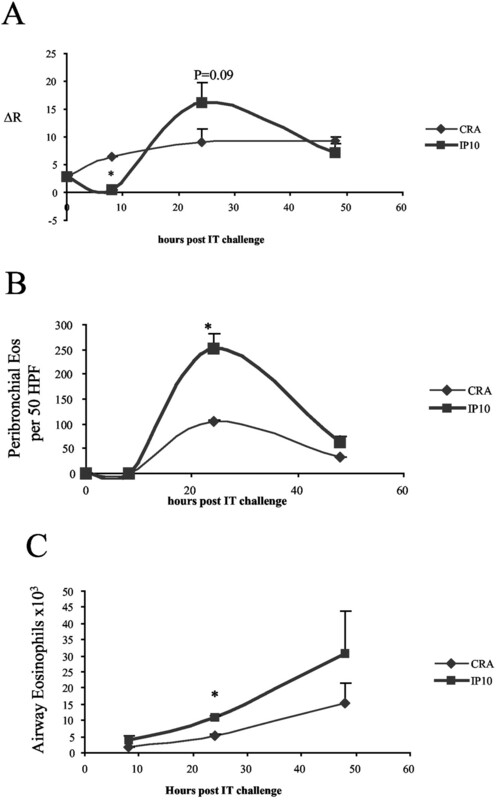 In separate experiments, 320 PNU of CRA in PBS or 80 ng of recombinant murine IP10 (PeproTech) in CRA was instilled directly into the lung via an intratrachial (IT) challenge on day 20 following initial sensitization. In additional experiments, the mice were also challenged IT with 90 μg of purified anti-IP10 Ab and CRA on day 20. Anti-IP10 Ab was purified from serum using protein A Sepharose columns and buffers developed by Pierce (Rockford, IL). The eluted Ab was concentrated by repeatedly spinning the eluate through a 30,000 m.w. centricon (Millipore, Bedford, MA) and the Ab concentration determined by dividing its absorbance at 280 nm by the Ab extinction coefficient (1.35). All described time points were measured after IT challenge on day 20. Airway hyperreactivity was measured using a Buxco mouse plethysmograph (Buxco Electronics, Troy, NY). Mice were anesthetized with 3.3 mg of pentobarbital (Vortech Pharmaceuticals, Dearborn, MI). The trachea was cannulated using an 18-gauge needle and mice were ventilated using a Harvard pump ventilator (tidal volume, 0.4 ml; frequency, 120 breaths/min; positive end-respiratory pressure, 2.5–3.0 cm H2O; Harvard Apparatus, Holliston, MA). Changes in the lung volume, represented by the change in box pressure were measured by a differential transducer. A second transducer was used to measure pressure swings at the opening of the trachea tube, referenced to the body box (i.e., pleural pressure) and to provide a measure of transpulmonary pressure ((Ptp) = trachea tube − box pressure)). The trachea transducer was calibrated at a constant pressure of 20 cm of H20. Resistance (R) was calculated by Buxco software (Buxco Electronics) by dividing the change in pressure (Ptp) by the change in flow (F)(δPtp/δF; units = centimeters of H2O per milliliter per second) at two time points from the volume curve based on a percentage of inspiratory the volume. Baseline hyperreactivity was recorded and change in hyperreactivity (ΔR) was measured after i.v. injection if 12.5 μg methacholine (Sigma-Aldrich) as previously described (31). Lungs were lavaged with 1.0 ml 0.9% saline (Abbott Laboratories, Abbott Park, IL). Bronchioalveolar cells were cytospun and stained with Diff-Quik (Dade International, Miami, FL) and the total number of airway cellular populations (monocytes, lymphocytes, neutrophils, and eosinophils) was determined. The left lobe of lung was excised, inflated with 10% formalin, and embedded in paraffin. Five-micron sections were cut and stained with H&E. The number of peribronchial eosinophils was determined by examining 50 consecutive ×100 high power fields around the largest bronchioles in each lung section. The lower right lobe of lung and mediastinal lymph nodes was excised and snap-frozen in liquid nitrogen. Lungs and lymph nodes were homogenized on ice using a Tissue Tearor (Biospec Products, Racine, WI) for 30 s in 1.0 ml of PBS (BioWhittaker, Walkersville, MD) containing 0.05% Triton X-100 (Sigma-Aldrich) and one tablet of complete protease inhibitor (Roche, Basel, Switzerland). Cytokine protein concentrations were quantified using basic sandwich ELISAs developed in our lab. Briefly, flat-bottom 96-well microtiter plates (Nunc Immunoplate I 96-F; Nunc, Roskilde, Denmark) were coated with 50 μl/well of polyclonal Abs specific for the chemokine or cytokine in question for 16 h at 4°C and then washed with PBS and 0.05% Tween 20. All Abs used for ELISA were purchased from R&D Systems (Minneapolis, MN) with the exception of IFN-γ in which Abs generated in our lab (as described above) were used. Nonspecific binding sites were blocked with 2% BSA in PBS an incubated for 90 min at 37°C. Plates were washed four times with wash buffer and cell-free supernatants were added (1:2 and 1:10) followed by incubation for 1 h at 37°C. Plates were washed four times before their incubation with the appropriate biotinylated secondary Ab for 1 h at 37°C. The plates were again washed four times, strepavidin-peroxidase conjugate (Bio-Rad, Richmond, CA) was added, and the plates were incubated at room temperature to the desired extinction. The reaction was terminated with 50 μl/well of 3 M H2SO4. Standards were 0.5 log dilutions of recombinant protein from 1 pg/ml to 100 ng/ml. Absorbance at 490 nm was measured using an ELISA reader. The left lobe of lung from mice immunized and subsequently challenged with CRA were excised 24 h post IT CRA challenge, inflated with formalin, and embedded with paraffin. Five-micrometer sections were cut and mounted onto glass slides. Lung sections were deparaffinized, rinsed in fresh xylene, and rehydrated through graded alcohol: 100, 95, 70, 50%, PBS for 3 min each. Endogenous peroxidase activity was quenched by incubating the rehydrated section in 1:1 methanol and 3% hydrogen peroxide for 3 min. IP10 protein expression was visualized using an HRP-3-amino-9-ethylcarbazole cell and tissue staining kit (R&D Systems) along with primary rabbit anti-mouse Ab against IP10 generated and purified in our lab (5.0 μg/ml) or rabbit IgG (Jackson ImmunoResearch Laboratories, West Grove, PA) (5.0 μg/ml) as an isotype control. The upper right lobe of lung from mice in which IP10 was systemically neutralized or which had been challenged with IP10 was excised and snap-frozen in liquid nitrogen. The lungs were homogenized in TRIzol (Life Technologies, Rockville, MD) and the RNA purified. The purified RNA was subjected to a DNAase treatment using a DNA-free kit developed by Ambion (Austin, TX) to remove any genomic DNA. A total of 1.0 μg of RNA was then reverse transcribed using an 18-mer Oligo(dT) (Sigma-Aldrich) and Moloney murine leukemia virus reverse transcriptase at 38°C for 60′; the reaction was stopped by incubating the cDNA at 90°C for 5′. One microgram of cDNA was then amplified using predeveloped chemokine receptor primer and probe pairs from Applied Biosystems (Foster City, CA) in a TaqMan 7700 thermocycler for 40 cycles of 50°C for 2′, 95°C for 10′, 95°C for 15 s, and 60°C for 1 h. The fold difference in mRNA expression between treatment groups was determined using software developed by Applied Biosystems. Lungs were dispersed in 0.2% collagenase (Sigma-Aldrich) in RPMI (BioWhittaker) + 15% FCS (Atlas, Fort Collins, CO) at 37°C for 45 min. Lymph nodes were dispersed over a 4-μm mesh filter into RPMI. After lysing RBCs with ammonium chloride buffer (4.01 g NH4Cl, 0.42 g NaHCO3, and 0.185 g tetrasodium EDTA in 500 ml dH2O), the cells were stained with either 0.5 mg/ml anti murine CD4-FITC (BD PharMingen, San Diego, CA) and anti-murine CXCR3 (Y-16) (Santa Cruz Biotechnology, Santa Cruz, CA) along with an anti-goat IgG-PE secondary Ab (Jackson ImmunoResearch Laboratories, West Grove, PA) (5 μg/ml) or anti-murine DX5 (Research Diagnostics, Flanders, NJ) (0.5 mg/ml) along with an anti-rat IgG-PE secondary Ab (Jackson ImmunoResearch Laboratories)(5 μg/ml) and anti-murine CD3-FITC (BD PharMingen) (0.5 mg/ml) in Dulbecco’s PBS + 5% FCS + 0.05% NaN3 for 20 min on ice protected from light. Cells were fixed in 4% paraformaldehyde and kept in the dark at 4°C until analysis. Cell populations were analyzed using a Coulter XL flow cytometer (Beckman Coulter, Fullerton, CA). Swiss albino mice infected with the parasite S. mansoni were obtained from Dr. F. Lewis (Biomedical Research Institute, Bethesda, MD). At 7–8 wk postinfection the mice were injected i.p. with 3,000 S. mansoni eggs and 50 ng of rIL-5 (R&D Systems) in 1 ml of 1.0% thioglycolate medium (Difco, Detroit, MI). Eosinophils were isolated via a peritoneal wash with 25 mM EDTA 48 h following i.p. egg injection. The isolated eosinophils were incubated in MC-9 media (DMEM + 15% PMSF, 15% FCS, 10% T-Stim culture supplement without Con A; Collaborative Biomedical Products, Bedford, MA), and 1 × 10−3% 2-ME) for 1 h at 37°C before further purification. The isolated cells were then resuspended in 90 μl of PBS + 0.5% BSA per 107 cells and incubated with 10 μl per 107 cells of anti-CD90 (Thy 1.2), anti-CD45RO (B220), and anti-MHC class II Abs coupled to magnetic beads (Miltenyi Biotec, Auburn, CA) and purified via negative selection by running the cell suspension through a magnetic column. 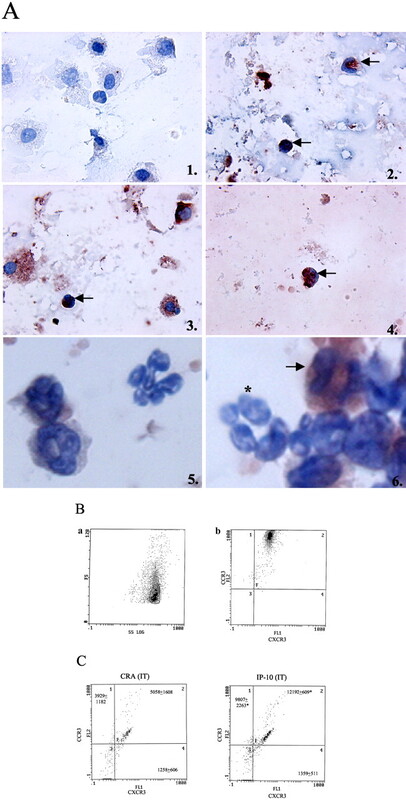 The purified population was consistently >98% eosinophils and these eosinophils were consistently >95% viable by trypan blue exclusion. The purified eosinophils were analyzed flow cytometrically (as described above) for the expression of CCR3 and CXCR3 using anti-murine CCR3 (R&D Systems) (0.2 mg/ml) along with anti-rat IgG-PE (Jackson ImmunoResearch Laboratories) and anti-murine CXCR3 (Y-16) (0.2 mg/ml) (Santa Cruz Biotechnology) along with anti-goat IgG-FITC (Jackson ImmunoResearch Laboratories). Airway cells were isolated from the lungs of mice challenged with IP10 and CRA on day 20 following initial sensitization via bronchioalveolar lavage (BAL) were cytospun and fixed in 4% paraformaldehyde for 10 min. The cytospins were stained using and anti-goat HRP-3-amino-9-ethylcarbazole immunostaining kit (R&D Systems) along with anti-murine CXCR3 Ab (Y-16; Santa Cruz Biotechnology) and goat IgG (0.2 mg/ml; Jackson ImmunoResearch Laboratories). Cytospins were counterstained with hematoxylin and photographed at ×100. In additional experiments, cells isolated from the BAL of mice 24 h following IT challenge with CRA or IP10 and CRA were stained with anti-murine CXCR3 (Y-16; Santa Cruz Biotechnology) along with anti-goat IgG-FITC (Jackson ImmunoResearch Laboratories) and anti-murine CCR3 (R&D Systems) along with anti-rat IgG-PE (Jackson ImmunoResearch Laboratories) and examined flow cytometrically, as described above. Statistical significance was determined by an ANOVA with p < 0.05, error is representative of the SEM. Analysis of IP10 protein expression in the lymph nodes of allergic mice challenged IT with CRA revealed an increase in IP10 expression at 24 h (0.82 ± 0.25 ng/ml) in comparison to sensitized but unchallenged animals (0.47 ± 0.05 ng/ml). IP10 protein expression in the lungs was also increased over 48 h following allergen challenge (Fig. 1⇓A). Immunohistochemical analysis of paraffin-embedded lung sections from sensitized and challenged mice illustrate that bronchial epithelial cells and alveolar macrophages express IP10 (Fig. 1⇓B). To better elucidate the role of IP10 in the allergic response, IP10 was systemically neutralized before allergen challenge and the phenotype of the ensuing inflammatory response in the lung determined. The ability of the Ab to neutralize IP10 was confirmed by the reduction of IP10 protein levels in both the lung (anti-IP-10 0.01 ± 0.001 ng/ml vs control Ab (cnt Ab) 1.54 ± 0.6 ng/ml) and mediastinal lymph node (anti-IP-10 0.56 ng/ml vs cnt Ab 2.4 ng/ml) at 24 h post IT challenge. Systemic neutralization of IP10 at the time of allergen challenge resulted in a significant increase in airway hyperreactivity which peaked at 24 h post IT challenge and returned to control levels by 48 h (Fig. 2⇓A). Eosinophil accumulation in the airspace was significantly increased following IP10 neutralization. This increased accumulation was observed as early as 8 h post IT allergen challenge and continued for 24 h following IT challenge (Fig. 2⇓B). Histological analysis of lung sections taken from treated mice revealed a trend toward an increase in the amount of eosinophilic inflammation around the airway 24 h following neutralization of IP10 (Figs. 2⇓C and 3). Analysis of mRNA expression in these lungs 24 h post allergen challenge revealed a marked increase in CCR3 and CXCR3 expression that paralleled the observed eosinophil influx (6.4 ± 0.65- and 4.8 ± 1.0-fold, respectively). Changes in bronchioalveolar populations of neutrophils and lymphocytes were not statistically different following systemic neutralization. Interestingly, the number of bronchioalveolar macrophages was significantly increased following IP10 neutralization (Table I⇓). Neutralization of IP10 in the airway at the time of allergen challenge had no effect on the allergic response in the lungs of these mice (data not shown). Thus, systemic, but not local, neutralization of IP-10 significantly altered the allergen-induced responses. IP10 protein expression in the lung following allergen challenge. To determine the expression pattern of IP10 during an allergic response in the lung, mice were challenged IT with CRA on day 20 following initial sensitization and IP10 protein expression in the lung was determined at various time points postchallenge (CRA). A, Baseline IP10 expression in the lungs of sensitized but unchallenged mice was determined on day 20 following initial sensitization (IN only) by sandwich ELISA as described in Materials and Methods, p < 0.05. The data represent the mean from n > 4 mice per group. B, Paraffin-embedded lung sections of mice challenged IT with CRA on day 20 were stained immunohistochemically with purified rabbit anti-IP10 Ab or isotype control Ab to determine the cellular expression of IP10; #, blood vessel lumen, ∗, bronchiole, ↑, positively stained macrophage. Airway hyperresponsiveness and eosinophil accumulation in the lung is increased following neutralization of IP10. Mice were injected with neutralizing Abs against murine IP10 (anti-IP10) or cnt Ab 45 min before an IT challenge with CRA on day 20 following initial sensitization. A, At various time points thereafter, the mice were anesthetized and their airway hyperresponsiveness (ΔR) following a methacholine challenge (100 μg/kg) (i.v.) was measured. B, Following analysis of airway hyperreactivity, the lungs were lavaged with normal saline, the cells were cytospun, stained with Diff-Quik, and the total number of airway eosinophils enumerated. The left lobe of lung was excised and fixed in formalin. Paraffin-embedded sections (5 μm) were stained with H&E. C, Peribronchial eosinophils were enumerated by counting 50 consecutive ×100 high power fields around the large airways in the lung. Graphs are representative of at least three separate experiments in which n > 5; ∗, p < 0.05. To determine the influence of IP10 on cytokine and chemokine expression, peripheral lymph nodes and lungs were excised and homogenized at various time points following allergen challenge. Systemic neutralization of IP10 at the time of allergen challenge reproducibly decreased IFN-γ levels in the lymph node at 4, 12, and 24 h following allergen challenge (Fig. 4⇓). Furthermore, IP10 neutralization also significantly decreased protein levels of IFN-γ in the lung at 12 and 24 h post allergen challenge (Fig. 4⇓). No significant changes in protein levels of IL-4, IL-5, IL-10, IL-12, or IL-13 were observed following IP10 neutralization (data not shown). These data suggest that systemic neutralization of IP10 may modulate the allergic immune response by decreasing the levels of the Th1-associated cytokine IFN-γ in the lung and lymph node. Increased peribronchial eosinophil accumulation in the lungs of mice following neutralization and local administration of IP10. Lungs were excised at 24 h post IT challenge, embedded in paraffin, and stained with H&E. Sections from mice treated with control Ab, or Ab against IP10 before IT CRA challenge along with those from mice challenged IT with PBS in CRA or rIP10 in CRA are shown at ×40 magnification. Arrows depict area shown in insert at ×100 magnification. Peripheral lymph nodes and lungs were excised and dispersed at various time points following neutralization and IT allergen challenge, stained for the presence of CXCR3+CD4+ and DX5+CD3+ double positive cells, and analyzed using a Coulter flow cytometer. We found that the number of CXCR3+CD4+ cells was decreased in the lymph node following IP10 neutralization (Fig. 5⇓). In addition, the number of NKT cells (DX5+CD3+) were significantly increased in the mediastinal lymph nodes of mice in which IP10 was neutralized (Fig. 5⇓). NKT cell and CXCR3+CD4+ cell populations in the lung were not significantly affected by systemic IP10 neutralization (data not shown). Our results suggest that neutralization of IP10 may alter the trafficking and/or expansion of lymphocyte subsets within the lymph node and thereby permit an exacerbated allergic response to develop in the lung. Flow cytometric analysis of cellular influx into the lymph node following IP10 neutralization. Individual mediastinal lymph nodes from mice treated with neutralizing IP10 Ab or cnt Ab (anti-IP10 and cnt Ab) before CRA challenge were excised and dispersed at various times following IT challenge. The total number of infiltrating CXCR3+CD4+ and DX5+CD3+ double positive cell populations were enumerated using a Coulter XL flow cytometer; n = 7; ∗, p < 0.05. Given our above findings on the ability of IP-10 to regulate the allergic response, the effect of exogenous airway IP10 administration was investigated. Sensitized mice were challenged IT with either recombinant murine IP10 (80 ng/mouse) in CRA or PBS in CRA. Airway hyperresponsiveness was significantly decreased 8 h following local instillation of IP10 and allergen challenge (Fig. 6⇓A). Subsequently, airway hyperresponsiveness rebounded and increased substantially at 24 h, although it was not significantly different from CRA control animals. Eosinophil accumulation in the lung (Figs. 3⇑ and 6⇓B) and in the airway (Fig. 6⇓C) was also increased following administration of exogenous IP10. Analysis of mRNA expression in these lungs 24 h post IT challenge revealed a significant increase in both CCR3 and CXCR3 expression (14.3 ± 2.8- and 3.0 ± 1.0-fold, respectively) that paralleled the observed leukocyte influx (see Fig. 3⇑). 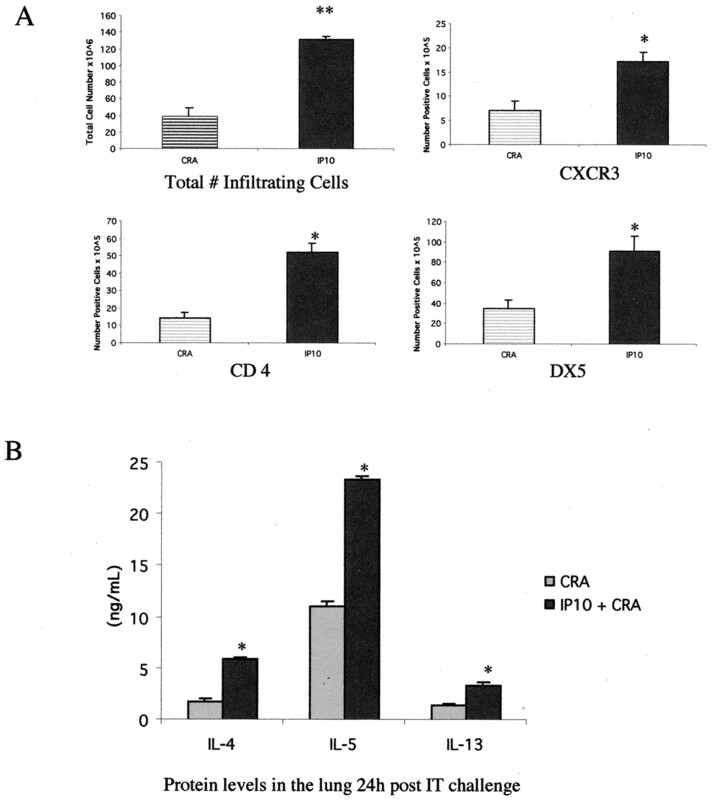 Immunohistochemical analysis of airway cells isolated from the BAL fluid of mice challenged with IP10 and CRA reveal that the recruited airway eosinophils and alveolar macrophages express CXCR3 (Fig. 7⇓A). Analysis of eosinophils isolated from mice infected with S. mansoni using flow cytometry reveal that >98% (98 ± 0.12%) of this cell population express both CCR3 and CXCR3 (Fig. 7⇓B). Flow cytometric analysis of BAL cells demonstrated a significant increase in the number of both CCR3+CXCR3+ and CCR3+CXCR3− eosinophils in the airways of mice 24 h post IT challenge with IP10 and CRA (Fig. 7⇓C). There was no significant difference in the number of CCR3−CXCR3+ granulocytic eosinophils in the airways of these mice. Local administration of IP10 into the lungs resulted in a significant increase in total lymphocyte recruitment as well as a significant increase in the number of CXCR3+, CD4+, and DX5+ cells in the lung (Fig. 8⇓A). Local administration of IP10 into the airway increases airway hyperreactivity and eosinophil influx. Mice were challenged IT with rIP10 in CRA (IP10) or PBS in CRA (CRA) on day 20 following initial sensitization. Airway hyperreactivity (A) and eosinophil influx into the lung (B) and airway (C) were measured at various time points following IT challenge. Graphs are representative of at least three separate experiments in which n > 5 mice; ∗, p < 0.05. CXCR3 expression on airway eosinophils. Airway cells isolated via BAL from mice challenged with IP10 and CRA IT were cytospun and stained immunohistochemically for the expression of CXCR3 (A); isotype control (1), anti-murine CXCR3 (2–4), and peripheral blood cells (5 and 6) isolated from S. mansoni-infected mice were cytospun and stained for CXCR3 expression (isotype control and anti-murine CXCR3, respectively). Arrows indicate positively stained eosinophils and the asterisk indicates a negatively stained neutrophil. Eosinophils were isolated and purified from S. mansoni-infected mice and stained flow cytometrically for the expression of CCR3 and CXCR3, a representative dot plot is shown in B. Airway cells isolated from the BAL from mice 24 h post IT challenge with CRA or IP10 and CRA were stained flow cytometrically, using the same gating parameters as with the purified eosinophils (Ba) to detect CCR3 and CXCR3 expressing cells (C). Dot plots shown are representative of n > 3, the numbers listed in each quadrant indicate the mean total number of cells in each cellular population calculated from the total number of cells recovered from the BAL fluid. ∗, p < 0.05. 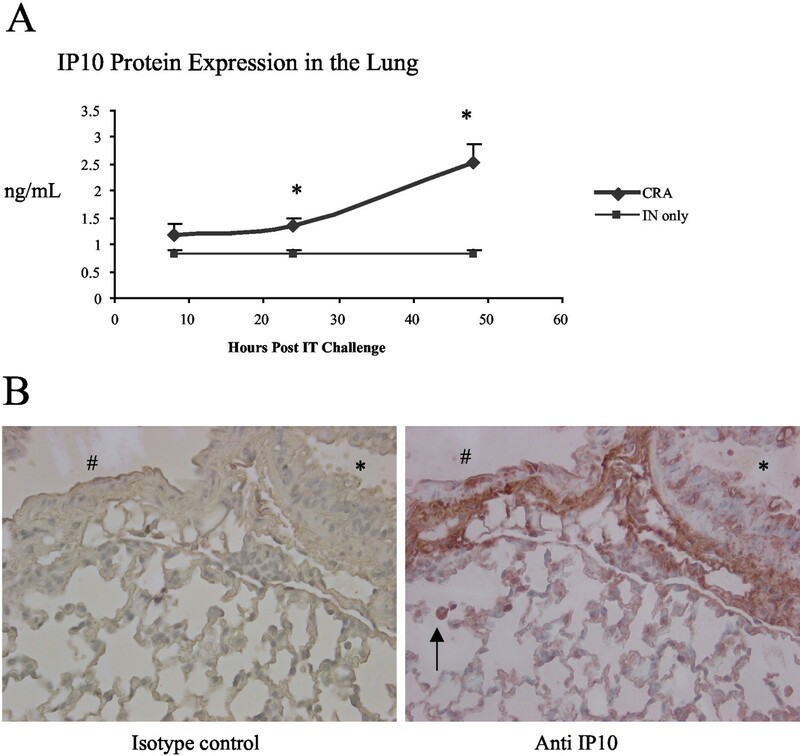 IP10 alters the cytokine profile and lymphocyte influx in the lung when given locally at the time of allergen challenge. 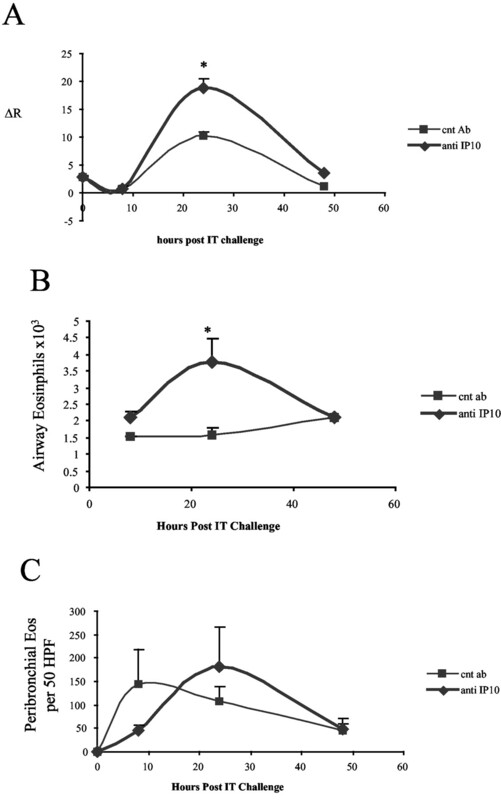 Lungs were excised at various time points following allergen challenge and either dispersed to analyze recruited cellular populations (A) or homogenized for determination of cytokine production (B). Graphs are representative of at least three separate experiments with n > 5 mice per group; ∗, p < 0.05, ∗∗, p < 0.005. The cytokine phenotype was also investigated in allergic animals receiving exogenous airway IP-10 administration. IL-4, IL-5, and IL-13 levels in the lung were significantly increased 24 h following local introduction of IP10 with allergen (Fig. 8⇑B). As IFN-γ levels are already quite low in this Th2 type model, no additional change was observed (data not shown). Thus, the exogenous instillation of IP-10 into the airway during allergen challenge resulted in the increased accumulation of eosinophils and lymphocytes with a corresponding increase in Th2 type cytokines. Recent studies by Wiley et al. (29) have demonstrated that overexpression of IP10 in the lung during sensitization with OVA alters the allergic response in the airway. The overexpression of IP-10 during sensitization inhibited eosinophil influx into the airway and decreased IL-4 levels in the BAL fluid along with a parallel increase in IFN-γ. Interestingly, the number of IFN-γ-expressing cells was increased while CD4+ T cells expressing the putative Th2 marker TS1/2 were decreased in the lung by IP10 overexpression. The present studies are patterned after the concept that IFN-γ-inducible proteins, such as IP10, may antagonize the development of Th2 responses (27, 29). In addition, the observation that introduction of exogenous IFN-γ into the airway can initially down-regulate the Th2-induced response may suggest that IP10 can have an immunomodulatory role during allergic responses (23, 26). A recent study using IP10−/− and systemic IP10 transgenic mice suggested that IP10 may play a contributory role in the allergic response (32). The data in the present study suggest that the role of IP10 would depend on the location and timing of its production. To further characterize the role of IP10 in the allergic response, we investigated the effect of IP10 neutralization on an established allergic response induced by CRA. Systemic neutralization of IP10 dramatically decreased protein levels of IFN-γ in the lymph node as well as in the lung. Together with the reduction of CXCR3+CD4+ T cells in the lymph node, the reduced levels of IFN-γ may allow for the development of an exaggerated Th2 response in the lungs (27). Airway hyperreactivity along with eosinophil accumulation in the lung and airway were increased following IP10 neutralization illustrating an enhanced allergic response. Our findings are in agreement with those of Wiley et al. (29), suggesting a crucial role for IP10 in not only directing the developing immune response to allergen but also in influencing an established allergic response. The effect of IP10 may be important in the lymph node as well as the lung and play a role in the trafficking of lymphocyte populations. IFN-γ is involved in the regulation of the prototypical Th1-mediated immune response through its ability to inhibit IL-4 and thereby the development of a Th2 type response (23, 33). Therefore, one possible effect of the reduction of IFN-γ following systemic neutralization of IP10 may be a reduction in the number of Th1 type cells that are primed and/or recruited in the lymph node that subsequently traffic as effector cells to the lung. Recent studies by Dufour et al. (34) using IP10−/− mice lends support to this concept as these mice demonstrate defective generation and trafficking of effector T cells in the lymph node. The observed decrease in IFN-γ in the present studies after neutralization of IP10 may have allowed for the development of an exaggerated allergic response in the lung as IFN-γ can inhibit IL-13-induced goblet cell hyperplasia and airway eosinophil accumulation (27). Interestingly, increased numbers of NK (DX5+CD3−) and NKT (DX5+CD3+) cells were observed in the lymph node following systemic neutralization of IP10. NKT cells are capable of rapidly secreting significant amounts of IL-4 upon repeated exposure to Ag and thereby polarize T cells toward a Th2 phenotype (35). Likewise, depletion of NK cells before initial immunization has been shown to inhibit airway eosinophil and CD3+ T cell accumulation as well as IL-4 and IL-5 levels in the BAL fluid (36). The absence of IP10 in the lymph node may allow for the trafficking of NK cells into the lymph node, leading to their subsequent activation. NK cells and certain subsets of activated CD4+ and CD8+ T cells have also been reported to express CXCR3 (37, 38). It has been established that CXCR3 is preferentially expressed on activated memory CD4+ T cells (CD45RA+ CD45RO+ CD69+ CD25+) but not on resting or naive CD4+ T cells (16, 37, 39). Although several reports have suggested that CXCR3 expression by CD4+ T cells is indicative of a Th1 phenotype in those cells, studies by Nanki et al. (40) using single-cell RT-PCR methodology have demonstrated that CXCR3 is not a definitive marker for Th1 cells in vivo. Additionally, Butcher and colleagues (37) have identified a subset of IL-4-producing CD4+ T cells that also express CXCR3. Therefore, the administration of exogenous IP10 into the airway of mice with an established allergic response may have resulted in an increase in the gradient for recruitment of CXCR3 expressing Th2 type cells and eosinophils. Previous studies have linked IP10 and its receptor CXCR3 to Th1 type immune responses (19, 20, 21). However, local administration of exogenous IP10 in the present studies in sensitized and challenged mice increased the allergic response in the lung and airway along with increased IL-4, IL-5, and IL-13 levels. Together, these data suggest an increase in the activation or recruitment of Th2 type cells into the lung (41). Interestingly, airway hyperreactivity was significantly reduced at early time points following instillation of IP10 with allergen, but subsequently resulted in increased airway hyperreactivity and eosinophil accumulation. Human peripheral eosinophils were originally reported to migrate to CXCR3 ligands MIG and IP10, confirming that CXCR3 was functionally expressed on these cells (42). Additionally, we have shown that murine eosinophils recruited into the airway during an allergic response also express CXCR3. Our results also suggest that exogenous administration of IP10 altered the local response by increasing recruitment of specific lymphocyte population and increased Th2 type cytokines. The latter effects resulted in an exacerbated allergic response that may be due to an increased chemotactic gradient for CXCR3 expressing cells. Taken together our findings demonstrate differential roles of IP10 characterized by the systemic vs local modulation of the allergic response. Our results suggest that systemically IP10 may be acting at the level of the lymph node, influencing the recruitment and/or activation of T cells. However, locally, the ability of IP10 to recruit eosinophils and possibly CXCR3 expressing Th2 type cells overrides any ability it may have to dampen the allergic response. We thank Kavita Ramen and Sara Cheng for their assistance with flow cytometry, Robin Kunkel for lending her expertise in graphic design, and Holly Evanoff and Pamela Lincoln for their invaluable technical support. ↵1 This work was supported in part by National Institutes of Health Grants AI 36302 and HL 31963. ↵3 Abbreviations used in this paper: IP10, IFN-γ-inducible protein 10 kDa; MIG, monokine induced by IFN-γ; PNU, protein nitrogen unit; CRA, cockroach Ag; IN, intranasally; IT, intratrachial; Ptp, transpulmonary pressure; BAL, bronchioalveolar lavage; cnt Ab, control Ab.